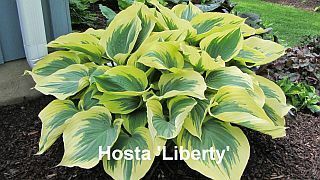 Hornbaker Gardens, Inc. is probably best known for our hostas. We carry over 400 varieties. The first display clumps were planted in 1987 and new varieties have been planted every year since then. In our display gardens visitors can see for themselves what mature clumps of any given variety will look like someday in their own gardens. In the retail sales area, potted hostas are arranged by size (Dwarf, Small, Medium, Large, and Giant), and alphabetically within the size. Most varieties have been field grown, with divisions being potted into one-gallon containers, except for some smaller varieties. In many cases, the one-gallon pot will contain multiple divisions. We do not multiply the price of the hosta times the number of divisions. You get the whole pot for the base price of the hosta. Hosta Highlights.....a quick reference sheet for sun tolerant, slug resistant, popularity polls, and more.